Zombie films have always been hotbeds of teeth-gnashing, blood splatter and almost the origin of stellar gore effects in cinema. But classics of the subgenre such as Danny Boyle’s “28 Days Later” and George Romero’s “Dead Series” have equally served as sociological petri dishes in which the filmmakers examine our own societies. While this breed of story has been explored by almost every filmmaking country in the world, South Korea has been interestingly, more or less, absent from the debate. Its horror and thriller films are bursting with creativity, originality and a unique voice in a flooded international market, set apart by works such as Bong Joon-ho’s “The Host,” Jang Cheol-soo’s “Bedevilled” and Kim Jee-woon’s “I Saw the Devil.” But with Train to Busan (original title, “Busanhaeng”), Yeon Sang-ho delivers a personal and emotional work that also pulls major blockbuster appeal from its stylish effects, raw acting power and masterful storytelling within a convincing zombie outbreak. The film is centered around a vivacious cast of characters as they travel from Seoul to Busan aboard the Korea Train eXpress (KTX). Though the main pair of protagonists are Seok-woo (Gong Yoo, “The Age of Shadows”) and his estranged daughter Soo-an (Kim Su-an, “The Battleship Island”) as he escorts her during a birthday trip to visit her mother, the cast is spread among the train. 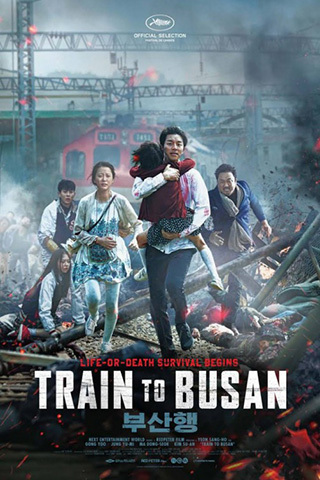 Each collection of characters are on the train for various purposes, but when a zombie virus breaks out in South Korea, these passengers struggle to survive among the trapped infected. It would be hard-pressed to find a substantial flaw in the production values or storytelling present in this superb movie. The emotional distance between the father and daughter is handled directly without being overbearing, allowing the chasm between the two be tested against this insane crisis rather than being easily set up to be healed with a hallmark ending. Nothing is ever certain between any of the characters, with many relationships altering continuously, and many supporting players becoming meat for the slaughter by incident, intent or surrender. This is brought to life by the bold and visceral acting of the cast, primarily by Ma Dong-seok (“Chronicles of Evil”), Choi Woo-sik (“In the Room”) and Jung Yu-mi (“Tough as Iron”). However, without a shadow of a doubt, the two strongest actors (thusly delivering the best results), are Yoo and Su-an, whose chemistry and pure emotional reactions to each other sell their performances every second they are on screen. Each decision the actor makes in their delivery is in tandem to the evolution (or devolution) of the characters they portray, complementing the change in tones and mindsets that each character undergoes to further the story. The cinematography crafted by Hyung-deok Lee (“A Company Man”) is crisp, effective and immersive; though initially acting too well within convention it forgoes most elaborate camera positions or movements. Shots are held for longer than most of this work’s contemporaries, relying more on racking focus to draw out the claustrophobia and tension within the train, especially as the amount of space they have available is continually reduced, thus brilliantly inferring how the experience is collectively shared between each cast member. Regardless if a character is to be killed off later, they are given just as much importance as any other, making it a genuine shock if someone finally does die. Coverage of the stunt work and fight scenes is never sporadically crazy either, relying more on what the character sees rather than for adrenaline injections into the image and pacing, adding impressionistic flourishes that could be pulled right from “Come and See.” This collection of intrusive and taut shots were mixed by editor Yang Jin-mo (“Okja”), whose magnificent sense of timing and parallel linear storytelling creates astonishing pacing and sense of space, especially when establishing the length of the titular train and the many people who are along for the ride. From the abrupt title card in the beginning moments to its somber contemplative ending, Train to Busan is far more than a damn good zombie flick, a deep character study into the roles we play in society, or an excellent practice in cinematic storytelling. The strength of the work is that there is never an extended moment of pandering, fluff or unnecessary frames. The movie is so systematically well-built that it’s actually quite amazing that the film isn’t more successful than it has been (it has, however, broken nationwide attendance records in South Korea, and is the current highest-grossing Korean film in Malaysia, Hong Kong and Singapore). Train to Busan is a wild ride, and one that can be enjoyed by any fan of cinema who can handle the trip. A Maryland-based film critic and award-winning filmmaker, founder of Heaven’s Fire Films. Has written film critique and theory for FilmSnobbery, Community Soul, The Baltimore Examiner, AXS, Men's Confidence Magazine, Screen Anarchy, and IonCinema. He writes the film theory column "Anarchic Cinema" for Film Inquiry, DVD/Blu-ray reviews for Under the Radar, and movie reviews for Film Threat.